Robert Glushko, UC Berkeley, School of Information, looks at the way humans organize things. People organize things. Books in libraries, spices in a cupboard, artifacts in a museum, records in a bank. But, despite the obvious differences among the different things we organize, there are important commonalities. All organizing systems — intentionally arranged collections of resources and the interactions they support — share common activities: identifying resources to be organized; organizing resources by describing and classifying them; designing resource-based interactions; and maintaining resources and organization over time. There are organizing principles and patterns that apply to libraries, museums, business information systems, sensor networks, personal organizing systems, and to every other type of intentionally arranged collection of resources. 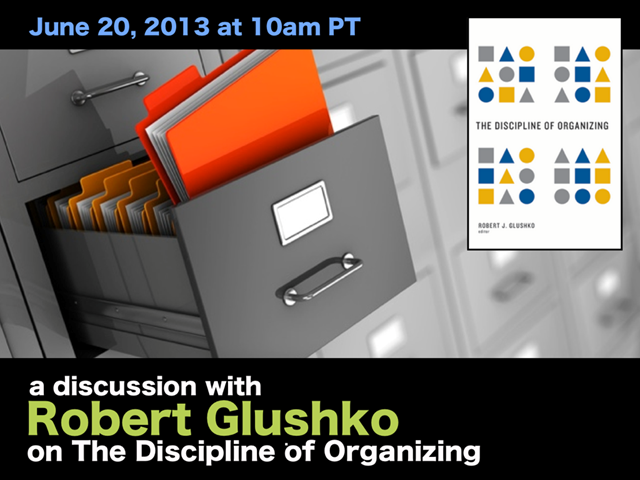 Join Scott Abel, The Content Wrangler, June 20, 2013 at 10am PT/1pm ET for a discussion with Robert Glushko, University of California at Berkeley, School of Information, for a look at the way humans organize things. They'll discuss various types of organizing systems, what they have in common, how they differ, and why it's important, in the digital content economy, that we identify patterns pf organizing and apply them to our own collections of things so we can create a discipline of organizing. Register today. It's free. Subscribe to The Content Wrangler channel to stay up-to-date on all of the many web discussions, presentations, and product demonstrations we showcase each month. If you value content as a business asset, worthy of being managed efficiently and effectively, you'll love the events we produce.